Cozmo Supermarket Chain , part of THE Group, a leader in the world of grocery shopping, is the entrepreneurial brainchild of a team of dedicated retail market professionals committed to excellence in all aspects of the term. 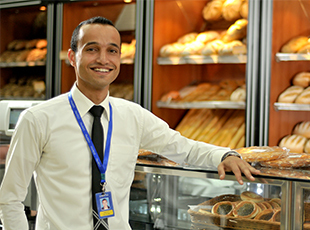 Proud of its Jordanian origins and role as a retail pioneer in both local and regional markets. At Cozmo, we work together towards one goal : making sure our customers get the best shopping experience possible. Employees are our biggest asset and the foundation of our success. Equal employment opportunity and diversity has been the core of our culture since we opened our doors in 2003. A chance to work within a fast-paced and a dynamic environment where employees can grow and develop; professionally and personally. Teamwork is our key to overcome challenges and to excel in our diverse lines of business. Want to be part of our evergrowing team ? View and apply to our latest Job Vacancies and add your CV to our data base by clicking here.